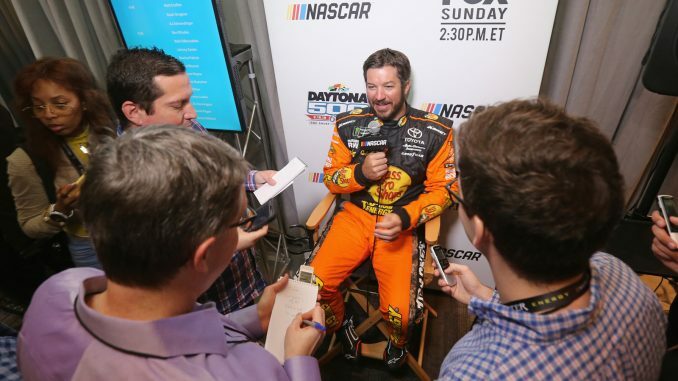 DAYTONA BEACH, Fla. – As the start of a new Monster Energy NASCAR Cup season arrives, life is quite a bit better for Martin Truex Jr.—not to mention noticeably different. Now that he’s returning to Daytona as the series champion, Truex feels that difference. “I do a little bit, honestly,” Truex told the NASCAR Wire Service on Wednesday at Daytona 500 Media Day at Daytona International Speedway. “I feel like less pressure, more relaxed, more confident than I’ve ever been. Excited to start the season—absolutely. It’s been a crazy, busy off season. Been a lot going on. Haven’t had much time off. Pollex was first diagnosed with cancer in 2014, Truex’s first season with Denver, Colo.-based Furniture Row Racing. Not until the end of the 2015 season, when he was paired with crew chief Cole Pearn, did Truex begin to realize the team’s potential—or his own. In 2016, Truex led more than 100 laps in eight different races, including a record 392 of 400 laps in a dominating victory in the Coca-Cola 600 at Charlotte, but hard luck kept him out of Victory Lane more often than he would have liked. Yes, Truex won four times, then a career-best, but he failed to duplicate his 2015 advancement to the Championship 4 race at Homestead. “I think any time you have to deal with disappointment—things don’t go the way you expected them to or thought they would or should—it’s a tough deal,” Truex said. “I don’t think it’s a bad thing to have to go through those things, figure out how to come out on the other side of them stronger. Though the 2017 championship is the pinnacle of Truex’s career so far, he feels his No. 78 Toyota team is capable of more—even with the stats he accumulated last year.